Headlies: MICHAEL MCGILLICUTTY TEARS SHOULDER WHILE DOING “BEHIND-THE-BACK” TOWEL TRICK / KAMALA MOWS LAWN - WrestleCrap - The Very Worst of Pro Wrestling! 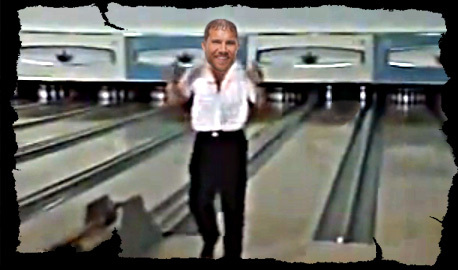 San Diego, CA – Michael McGillicutty has found it difficult to live up to the lofty legacy of his Hall of Fame father, “Mr. Perfect” Curt Hennig. Since McGillicutty set foot in WWE in the summer of 2010, he’s been unfairly compared to his predecessor. McGillicutty possesses not the golden flowing locks, the timing, the precision, or even the unsinkable liver that made Mr. Perfect a locker room icon. Heck, McGillicutty doesn’t even have the ability to be “perfect”. After a recent Monday Night Raw, wherein McGillicutty got 1/100th of the reaction that Hennig used to get, the WWE Tag Team Champion was determined to become his father, through sheer force. McGillicutty kept on trucking, trying to catch that elusive, taunting towel, until tragedy struck. It’s unknown if McGillicutty will miss any time, but as he was whisked away by ambulance to the nearest “medical facility”, his colleagues recalled other issues McGillicutty has had being in his father’s shadow. It appears that Curt Hennig’s legacy of “perfection” is too much for his son. McGillicutty is also apparently enamored with the video of his father catching his own 75 yard touchdown pass, and has spent weeks trying to find former Vikings tight end Steve Jordan to notorize his own attempt at an impossible deep throw. Meanwhile, WWE CEO Vince McMahon was unhappy to hear of his talent being injured on company time, and has already wished the towel well in its future endeavors. Uganda – Alright, look. 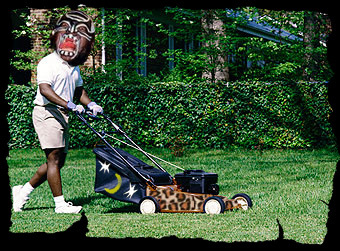 I have no intention of writing five hundred-plus words for a satire about an African American professional wrestler, known for playing a jungle savage despite being an American, mowing his lawn. There’s no way I can stretch an article to that length and keep it interesting. The truth is, the other day, I, Justin Henry, was thinking about silly it would be to see Kamala do certain household tasks while in his “Kamala” garb. I thought it would be really, REALLY funny to see Kamala, as Kamala, mowing the lawn. Why, I tell you, I couldn’t stop laughing the minute I thought of it. Between fits of laughter, I e-mailed my good friend, WrestleCrap foreman RD Reynolds, and told him I wanted to do an article about Kamala mowing the lawn. I did this because RD takes joy in creating photoshop images for my lead stories here on Headlies, and I knew that, with enough notice, he would do a graphic of freakin’ Kamala mowing the lawn. The picture above is the fruit of his labor. I got what I wanted, a picture of Kamala mowing the lawn. And you know something? It’s made me laugh harder than the visual I had of it in my head. Before, it was just an abstract idea, a cerebral blueprint as it were. Now, it’s on the internet for the world to see: Kamala mowing the lawn. I don’t know what I take more pleasure in: the picture existing, or the fact that something so infantile that my mind conjured up became something that RD Reynolds, a man that has written THREE BOOKS, took time out of his busy life to make a picture of, for the humorous edification of his many regular readers. I’ll be on my deathbed one day recalling my many feats, and right up there with getting a college degree and winning soccer championships will be my getting RD to make such a silly picture. Look at it! Look at the picture! Wouldn’t YOU be proud to have something so ridiculous and infantile displayed before thousands of readers? Then again, maybe I’m the problem with this world, this mortal coil, that we weave about like rats within. Maybe RD and I could have done something much more productive, but no. My giddiness and my childish disposition have deemed it fit to have this be our weekly output. We could have done more, like call to an end to human genocide, or take time and feed the needy. Instead, here we are, waiting for feedback on a silly picture of a black man mowing the lawn. I mean, I’m laughing at it, but there’s just more that we could have done. Perhaps one day, this website will do something to enrich the minds of those who care to read the words and absorb the images. When that day comes, I will cast aside all labels of me being a goofy ninny with nothing better to do than convince an erstwhile hard-working family man to create pointless images like the one on display in this article. But until that day comes, enjoy Kamala mowing the lawn. I know I am. Induction: TNA on Family Feud: We asked a hundred has-beens what kind of job they wanted in TNA. No, wait, that was Hulk Hogan.